Yes, American Media reported these first and Sasquatch has been a subscriber ever since. But can the just released details of the George W. Bush-Condoleeza Rice relationship and the alleged rift between Dubya and Laura (as published in the current edition of THE GLOBE) really be true? Not in a million years. Then again -- if there's something to this, please remember that you learned about it here first. 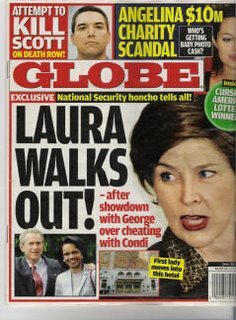 Laura Pulls Out! Next edition: George Pulls Out! Uh, no, they wouldn't want to leave impression they're talking about Iraq.